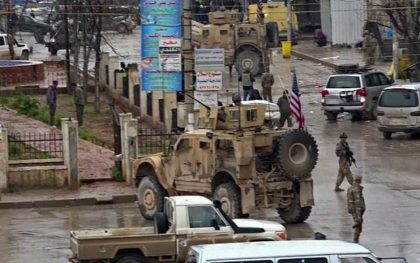 A bomb attack in northern town of Manbij killed Wednesday several people including three US forces whose patrol appeared to be the target of the attack amid beginning of pullout, reports say. The blast claimed by the Islamic State group (ISIS), according reports citing the Syrian Observatory for Human Rights (SOHR) based in the UK, destroyed a restaurant in Manbji left 16 people dead. ISIS on its news agency Amaq said one its suicide bombers inflicted losses to the international coalition fighting the terror group since 2014. “A suicide attack carried out with explosives vest hit an international coalition patrol in the city of Manbij,” it said. The coalition in a statement said it lost four US “service men” who were conducting a routine patrol. The incident occurred as the U.S begins withdrawing its forces from Syria as announced by President Donald Trump last month. Vice President who was the first US official from the Trump administration to speak in the wake of the attack maintained the White House’s plans to pull forces out of Syria but added that American forces in stay in the region to ensure ISIS defeat. Turkish President Recep Tayyip Erdogan at a press conference with his Croatian counterpart Kolinda Grabar-Kitarović in Ankara increased the death toll to 20 including 5 American service men, Turkish media Daily Sabah reports. “The attack in Manbij might have been meant to affect Trump’s decision to pull out from Syria. But as I saw Mr. Trump’s decisiveness, I don’t think a backward step would follow such a terror attack. Otherwise, it would mean a victory for Daesh,” he added using the Islamic name of the terror group. Manjib and its surroundings are controlled by US-backed Syrian Kurdish forces, Syrian Democratic Forces (SDF).